From the wrap-around porch, double gables, and custom window details on the exterior to the formal and casual living areas, this grand four bedroom farmhouse has it all. Formal living and dining rooms face each other across the foyer in front while an expansive family room opening to the lavish kitchen/breakfast area provides casual living in the rear. A fireplace, wet bar, and porch with impressive decking make this a great entertainer. 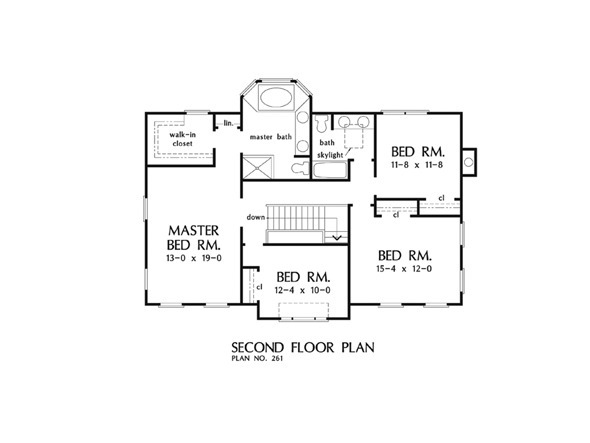 This floor plan's spacious master suite features a walk-in closet and luxurious bath with shower, whirlpool tub, and dual lavs. 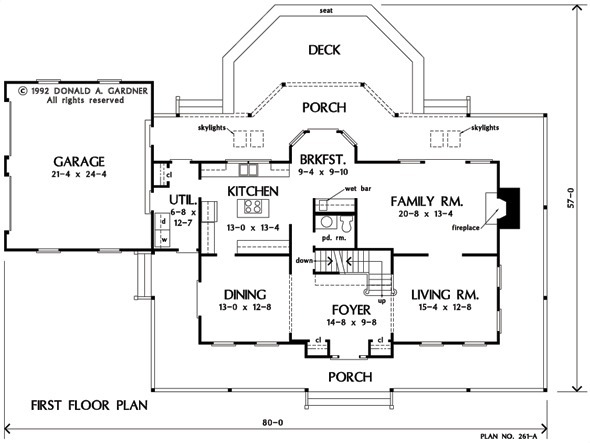 1st Floor: 1357 Sq. Ft.
2nd Floor: 1204 Sq. 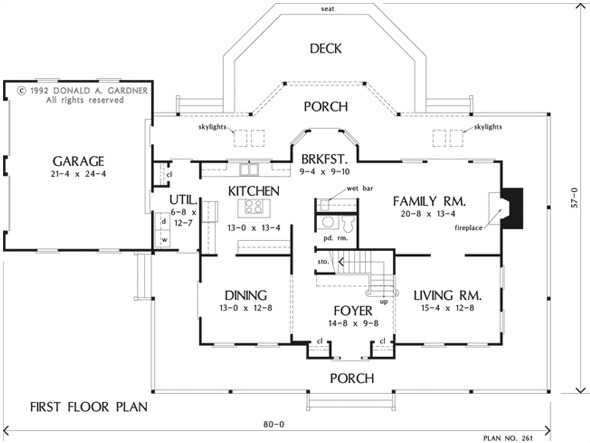 Ft.
House Dimensions: 80' 0" x 45' 9"
Great Room: 20' 8" x 13' 4"
Master Bedroom: 13' 0" x 19' 0"
Master Bedroom : 13' 0" x 19' 0" x 9' 0"
Bedroom #2 : 12' 4" x 10' 0" x 9' 0"
Bedroom #3 : 11' 8" x 11' 8" x 9' 0"
Bedroom #4 : 15' 4" x 12' 0" x 9' 0"
Porch - Front : 58' 4" x 7' 0" x 0' 0"
Porch - Rear : 51' 0" x 7' 0" x 0' 0"
Porch - Left : 7' 0" x 13' 9" x 0' 0"
Porch - Right : 7' 0" x 27' 0" x 0' 0"
Deck / Patio : 29' 8" x 16' 0" x 0' 0"
Living Room : 15' 4" x 12' 8" x 9' 0"
Storage (1st Fl.) (Sloped): 8' 0" x 3' 2" x 0' 0"
Foyer : 14' 8" x 9' 8" x 9' 0"
Great Room : 20' 8" x 13' 4" x 9' 0"
Breakfast Room : 9' 4" x 9' 10" x 9' 0"
Utility Room : 6' 8" x 12' 7" x 9' 0"
Garage : 21' 4" x 24' 4" x 0' 0"